Home » Advocacy » Just a Typical Call. . .
Just a Typical Call. . . Imagine if you will. . .
It’s a typical day for you. You came into work, just like any other shift, you got assigned your truck, and you hit the streets. You did a few calls, here and there, mostly routine, you transported them, finished your paperwork for each, and got yourself back on the road. Then, you are dispatched to a male in crisis. You arrive on scene, just like any other call to find the depressed, suicidal, and slightly intoxicated patient. You put him on the stretcher, and place his bag on his lap and load him into the ambulance. Initially, your patient is calm and cooperative, so you hop in back, sit on the bench seat, and get on your way to the city hospital, just like any other call. 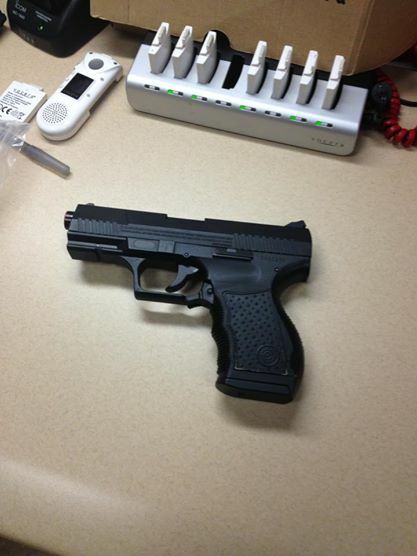 Without warning, the patient goes into his bag and pulls from it a black handgun. A scuffle ensues, and you are able to disarm the patient, restrain him and finish the transport. After removing your heart from your stomach, you inspect the gun and find it to be a BB gun. Regardless though, you feared for your life, and you are assured that after being medically cleared, the patient will be dealt with by the proper authorities. This really happened to a good friend of mine. Lucky for him and his family, he was fine. The outcome of the patient, or rather the assailant, however, is unknown to me. BB gun or not? Could you tell the difference in the split second when its pulled on you? Safety is a growing issue. Recently, a Jersey City EMT had a knife pulled on them in the back of an ambulance. They were able to dodge the first swipe, sustaining only a minor laceration, but the party they were transporting then impaled the knife in the EMT’s shoulder. Fortunately, the injuries sustained by the EMT were not serious, and according to an article I read, they will be fine. An official in Jersey City made some eye opening comments in the article. Robert Luckritz, the Director of Jersey City Medical Center Emergency Medical Services said that “some EMTs accept it as part of the job.” He went on to add that “it is relatively common that EMTs are assaulted and it is a significant issue.” I have known Rob for a number of years. We went to college together, and while some found his first statement alarming, I am confident that it was most likely taken out of context by the reporter. I have no doubt that Rob is anything but complacent and wants the best for his people. The second comment is spot on though. Far too often, when it comes to public safety personnel being assaulted, EMS professionals seem to end up as the forgotten few. Thankfully, in the case in Jersey City, charges were almost immediately filed, but in the case of my friend, well, there either has not been any word passed down to him, or not enough was done. I hope that it’s the first one, because the actions of the party who pulled the gun on him, BB Gun or not, are inexcusable. Injuries happen. People hurt themselves while dealing with and restraining patients. Every twisted ankle, or back strain should not be followed up by criminal charges, but when someone purposely goes out of their way to harm, or attempt to harm, any EMT or paramedic, the hand of the law should be swift and heavy. Nothing shy of that is appropriate. Services should follow up and push the issue with law enforcement if their employee wants something done about it, and EMS advocates should be on law maker’s doorsteps stressing the importance of laws structured to protect emergency responders. When I was an EMS supervisor, my first goal was to do my best to make sure that everyone on my staff went home at the end of their shift, and with the same number of holes in their body that they came to work with that morning. To anyone out there who is a supervisor or in management, I implore you to do the same. And when faced with the unfortunate situations like the ones above, do not allow anyone to write them off with statements like, “He was drunk” or “he was upset” or “he’s just sick.” Each incident of assault, no matter how serious, needs to be investigated both internally, and when appropriate externally. Our response to these situations needs to improve. We need to teach our people everything they need to know to make sure that they are safe in the field. And when the unfortunate happens, our leaders need to be the loudest, most outspoken advocates for whatever needs to be done. People need to be prosecuted, and when necessary laws need to be rewritten. We need to be protected. Agreed. If these patients were to attack an ordinary citizen on the street, charges would be filed, regardless of diminished capacity, i.e. drunk, sick, mentally ill.
Scott, after a few “encounters”, I began the routine of asking patients “Do you have anything on you that could be used to harm me?”. Most of the time, after speaking to them in a calm manor, they would tell me if they were carrying weapons. Even chatting up the violent drunks usually paid dividends . The ones who did not answer the question were the ones to worry about. We owe it to ourselves to be proactive with our safety!